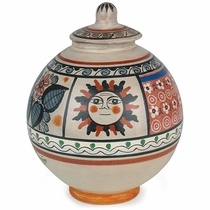 These unique Tonala pottery pieces are handcrafted and hand painted by Florentino Jimon Barba in Mexico. 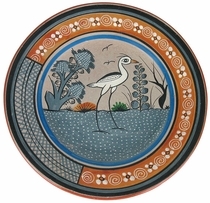 The Jimon family are masters of pottery and have been making it for generations. 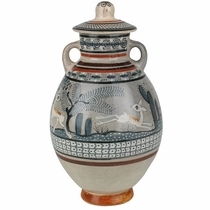 Jimon pottery vases and decorative items are well known for their earthy blue, red, green and black color schemes and intricate designs. 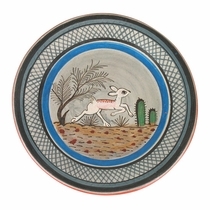 These ceramic pieces are all signed by the artist and are wonderful southwest collector items. These pieces are one-of-a kind, no two are alike, so specific imagery cannot be guaranteed. 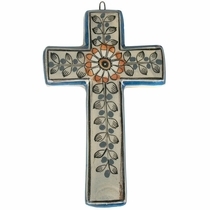 Your order will be chosen from our current assortment of designs. 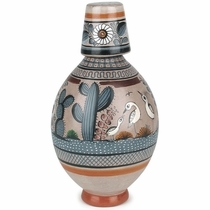 Look through all of our Jimon pottery items to get an idea of the variety of southwest, floral and animal designs you can expect.